Visit the historic heart of French Canada on this day trip from Montreal to Quebec City. On your sightseeing tour, see famous landmarks including Place Royale, Notre Dame Basilica, the Parliament Building, Montmorency Falls and the Plains of Abraham as you explore quaint narrow streets filled with old-world charm, and learn about the city’s fascinating French-Canadian history from your guide. Enjoy free time to walk through Old Quebec, a UNESCO World Heritage site, and take a scenic cruise on the St Lawrence River during the months of May through October! 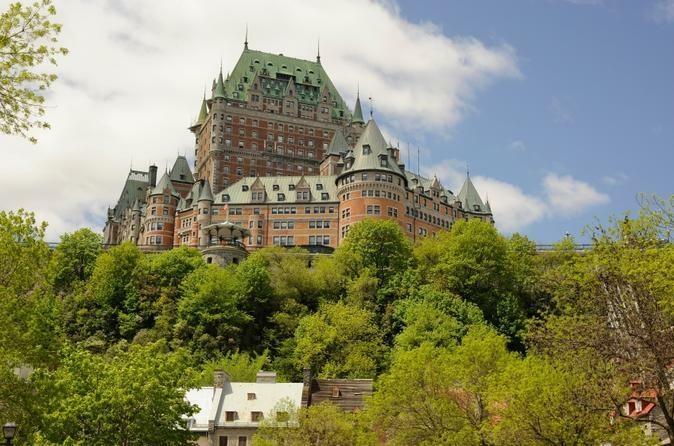 After pickup from your Montreal hotel, you’ll be taken 2.5 hours northeast by coach to Quebec City, the historic heart of French Canada located on the St Lawrence River. The oldest settlement in North America, this capital city’s charming narrow streets and quaint neighborhoods are steeped in fascinating history. On your sightseeing tour, your knowledgeable local guide will explain the history of Quebec City, which was founded as a fort by the French in the 1500s. Pass famous landmarks and historical treasures including picturesque Place Royale, Notre Dame Basilica, the Parliament Building, Ile d'Orleans and the Plains of Abraham, where the famous battle between the French and English took place in 1759. Visit the oldest quarter in North America, the Petit Champlain district, and admire views of Montmorency Falls, an incredible waterfall and emblem of the city seated between the Montmorency River and the St Lawrence River. This magnificent natural gem is taller than Niagara Falls! Enjoy free time after your tour to explore Old Quebec, a UNESCO World Heritage Site. During the months of May through October, you can choose to take a scenic 1.5-hour cruise on the St Lawrence River during your free time! Your tour ends with drop-off at your Montreal hotel.